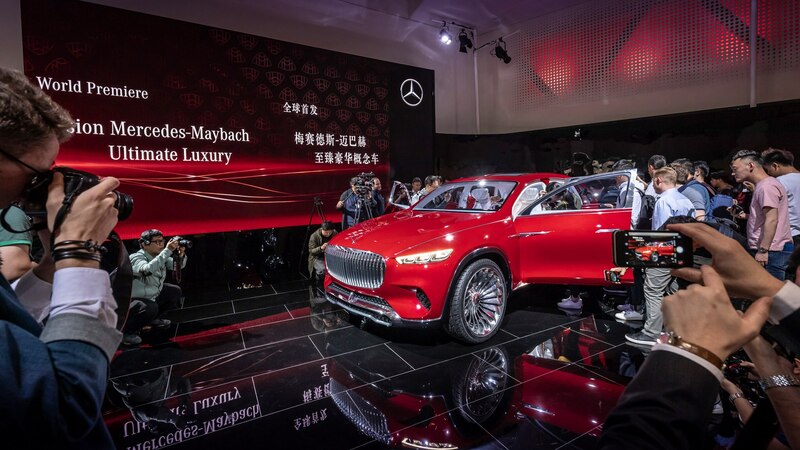 Last summer Mercedes-Maybach wowed us with its Vision Mercedes-Maybach 6 Cabriolet. 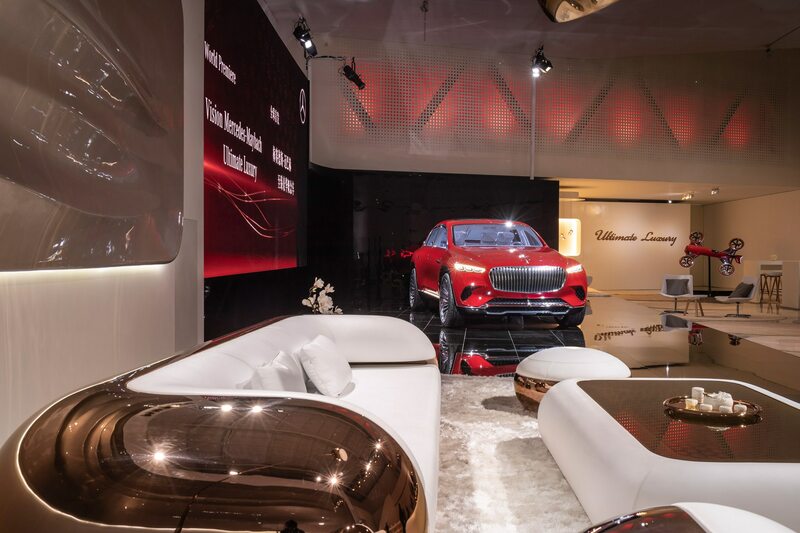 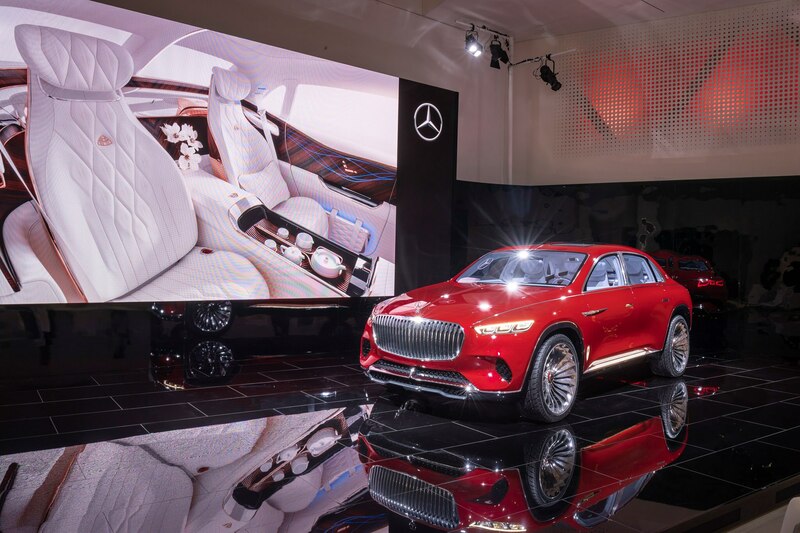 The marque’s latest show car called the Vision Mercedes-Maybach Ultimate Luxury, wowed us as well, though for different reasons. 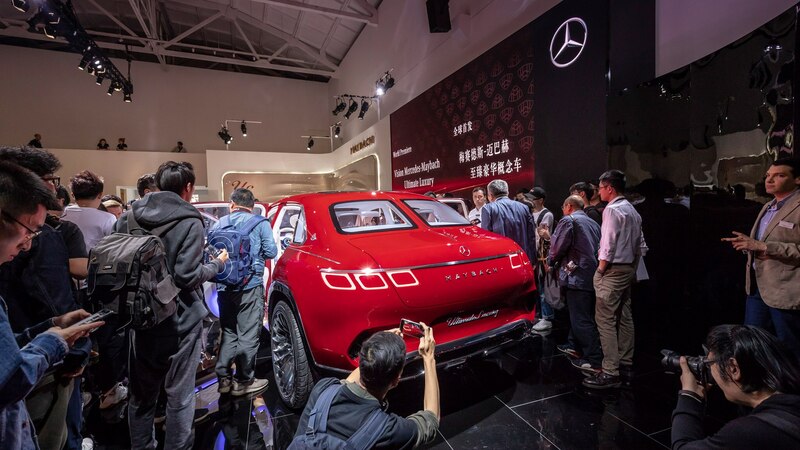 It’s being shown at Auto China 2018 in Beijing and it’s a real doozy. 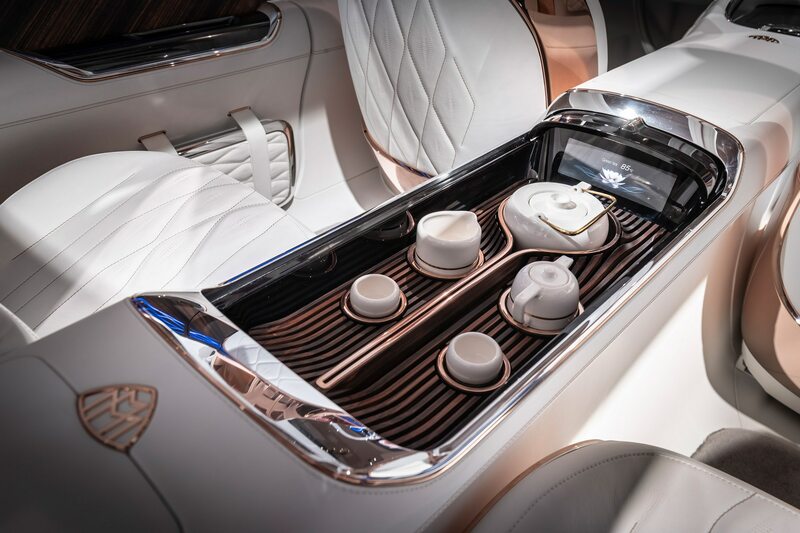 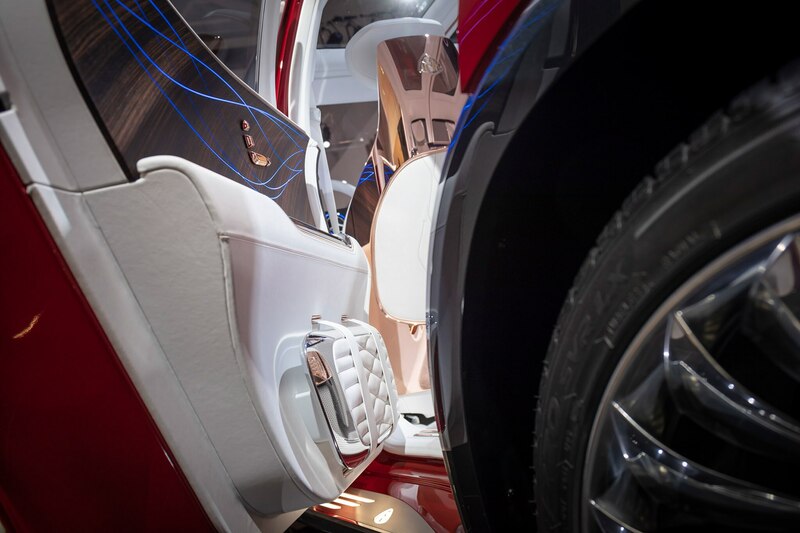 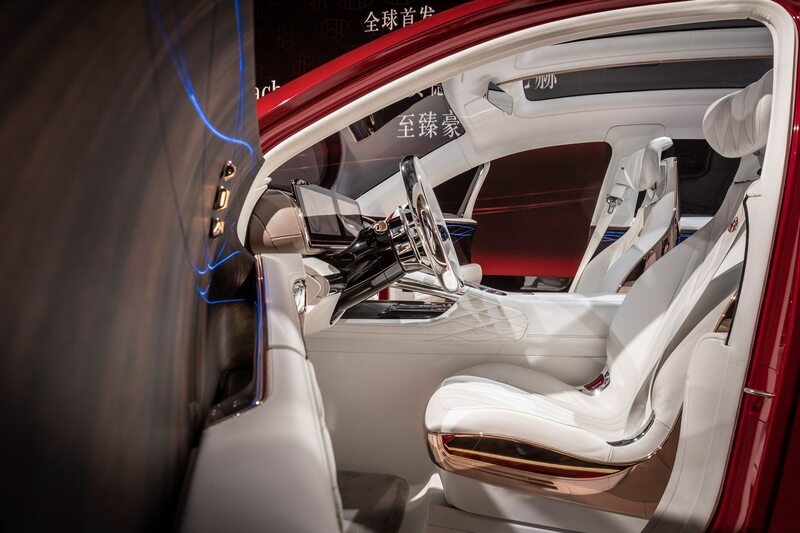 The chunky, crossover EV looks even better on the inside and is made for wealthy Chinese tea sippers—it comes with a center console with a heated tray for a teapot and cups for its rear passengers. 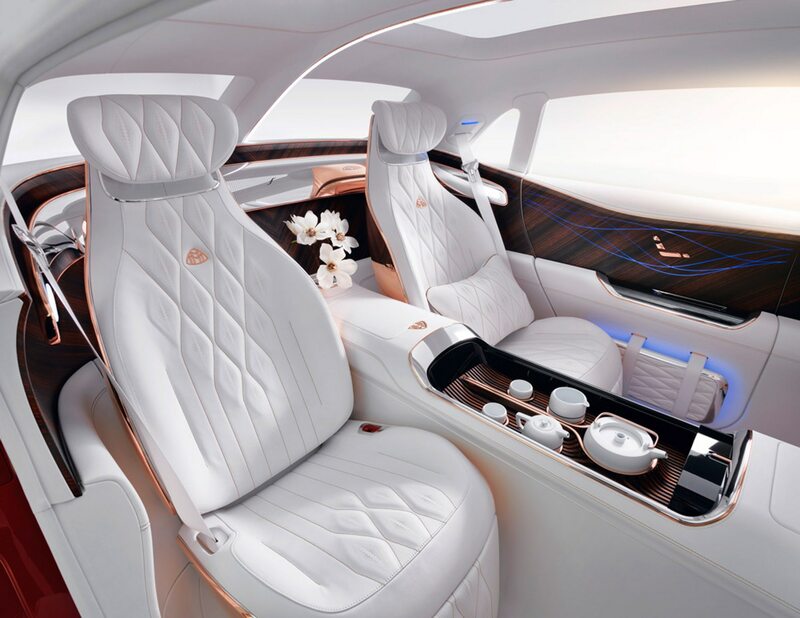 We hope the chauffeur at least gets a massaging seat. 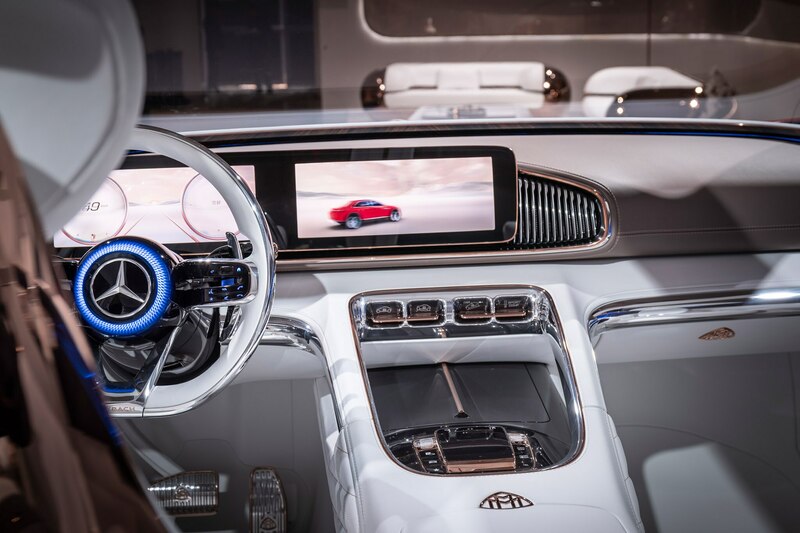 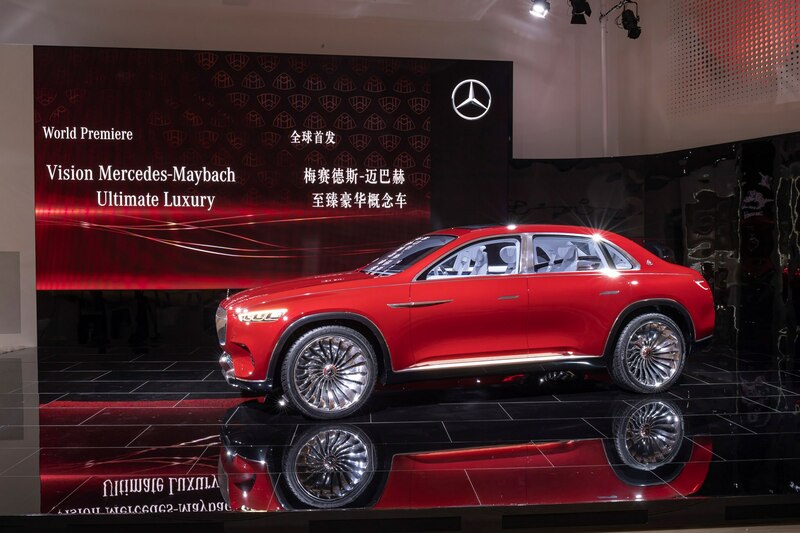 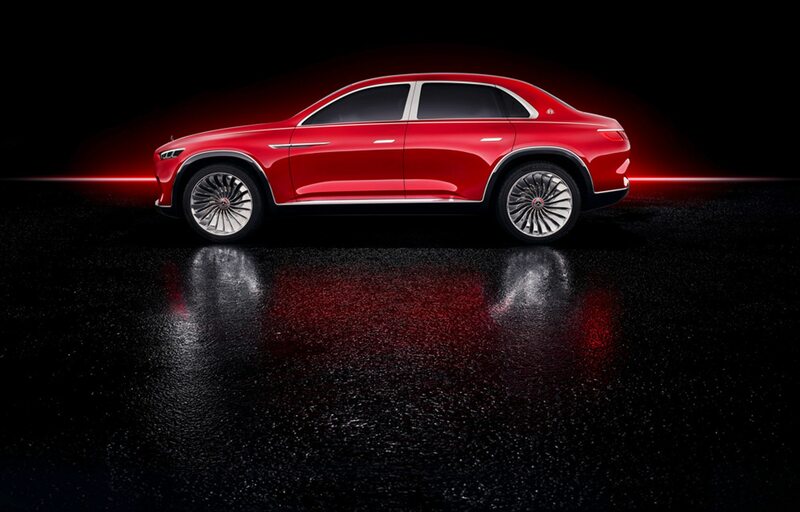 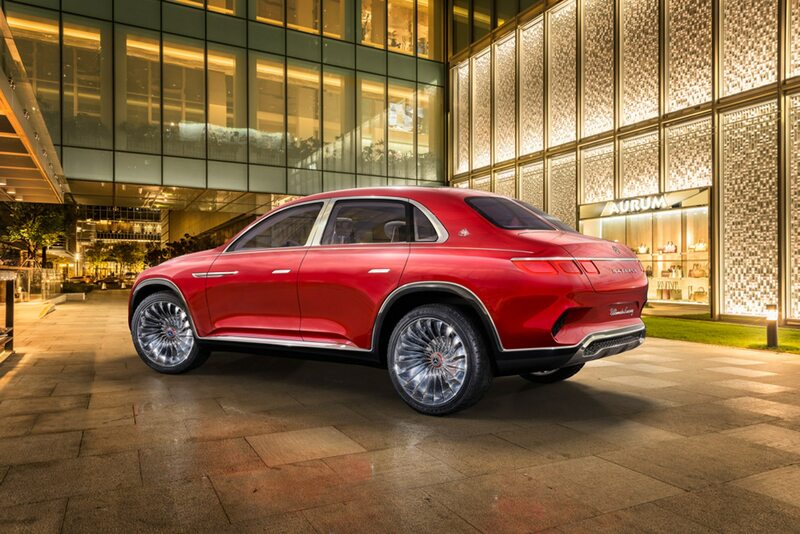 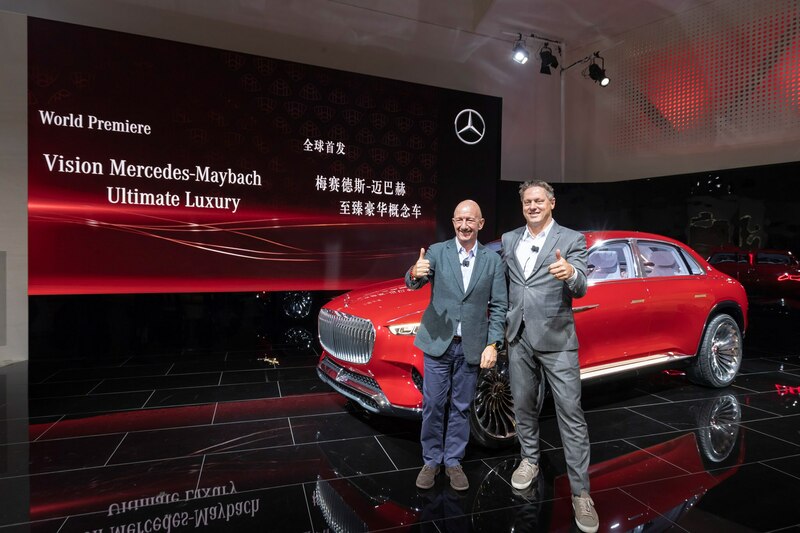 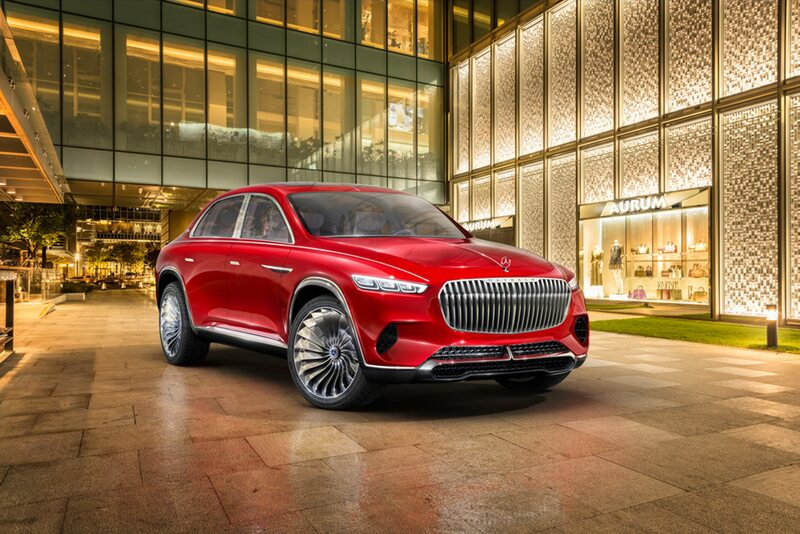 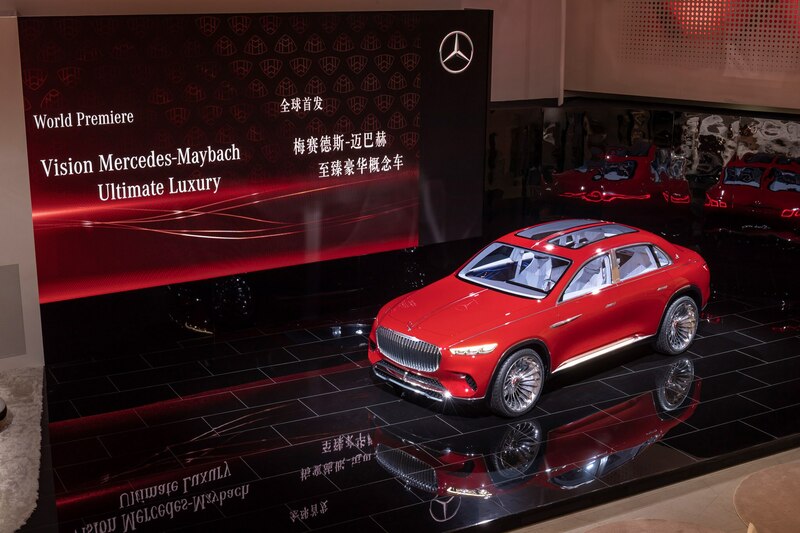 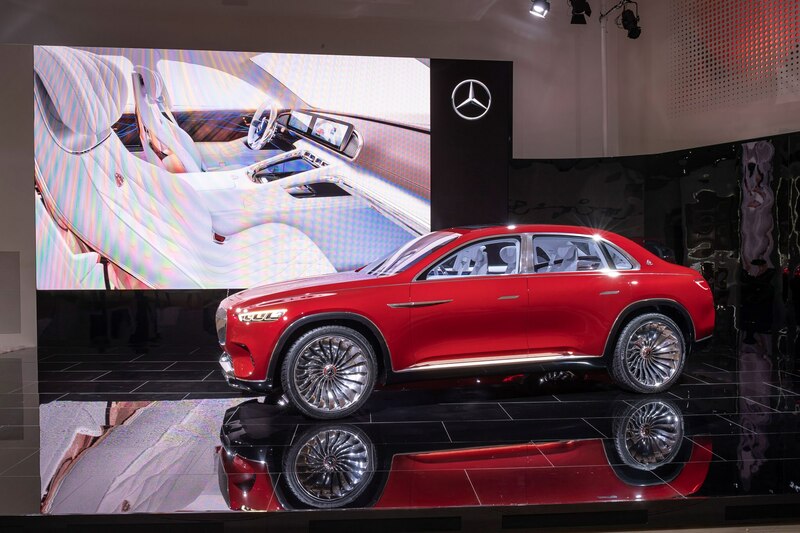 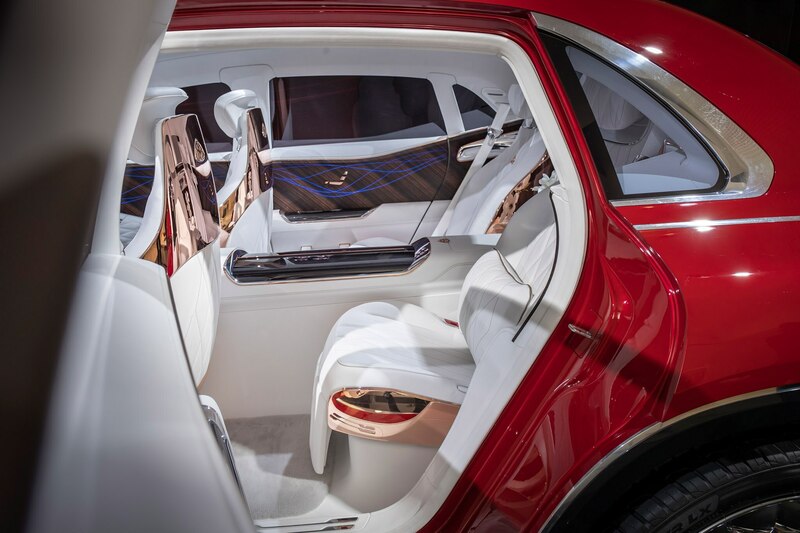 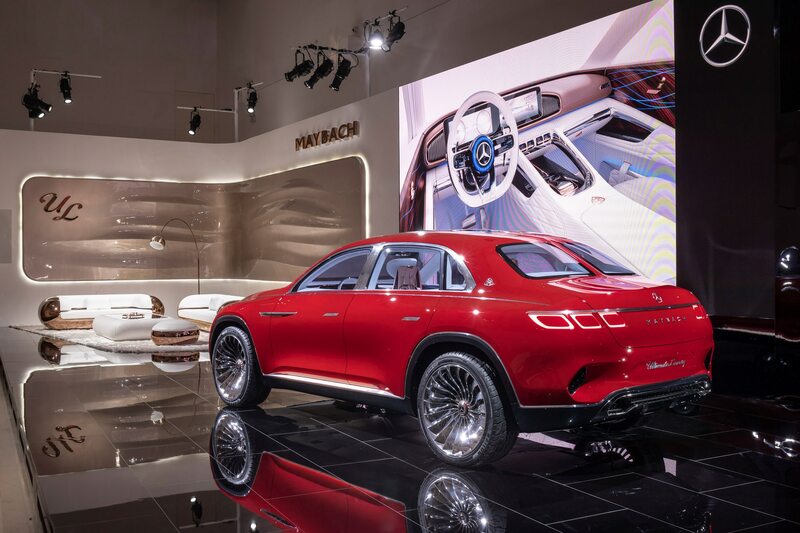 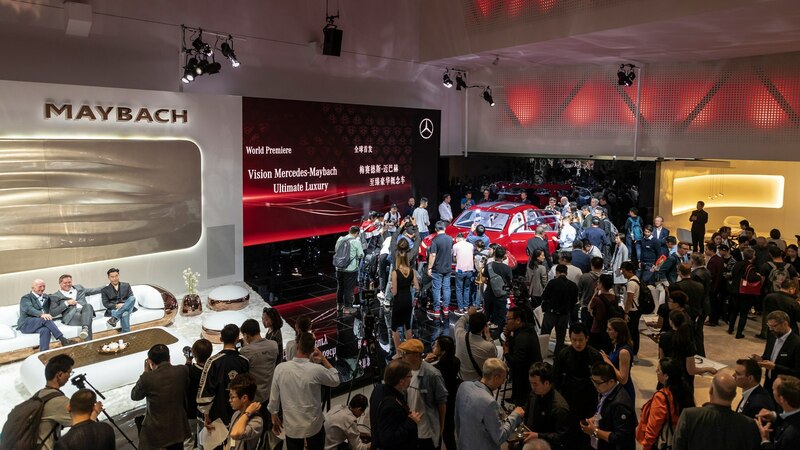 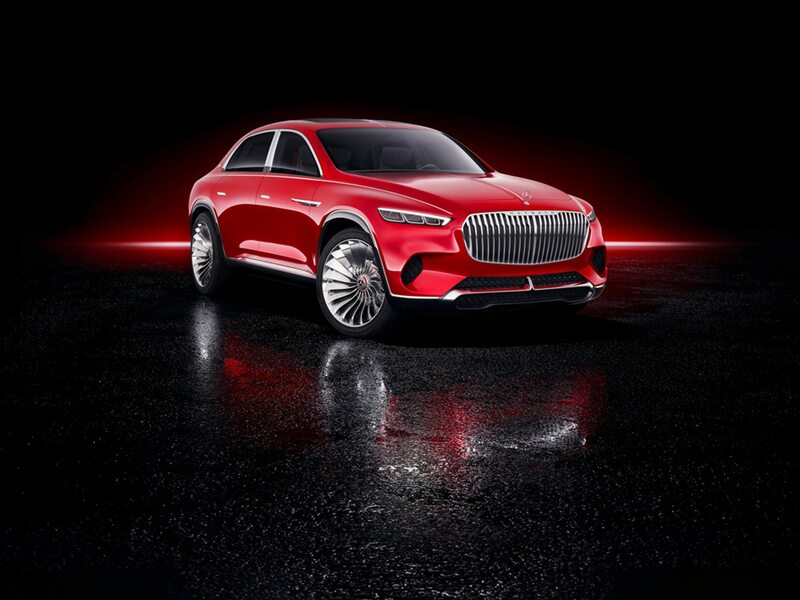 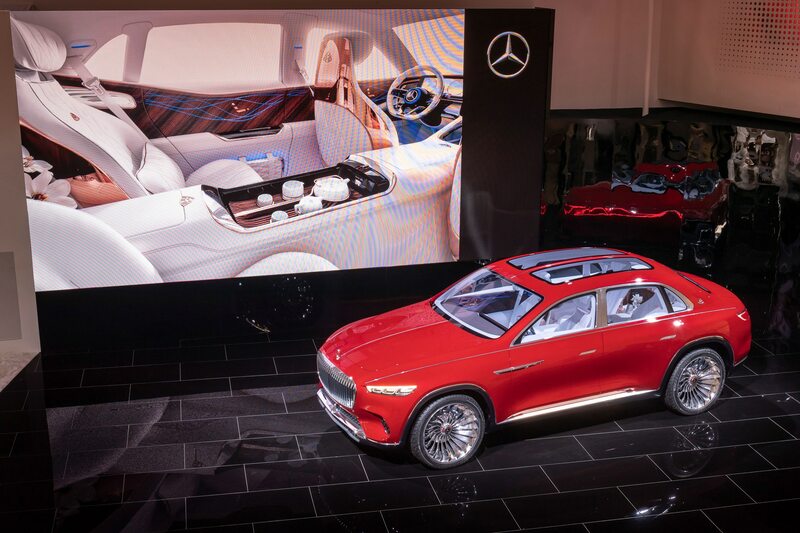 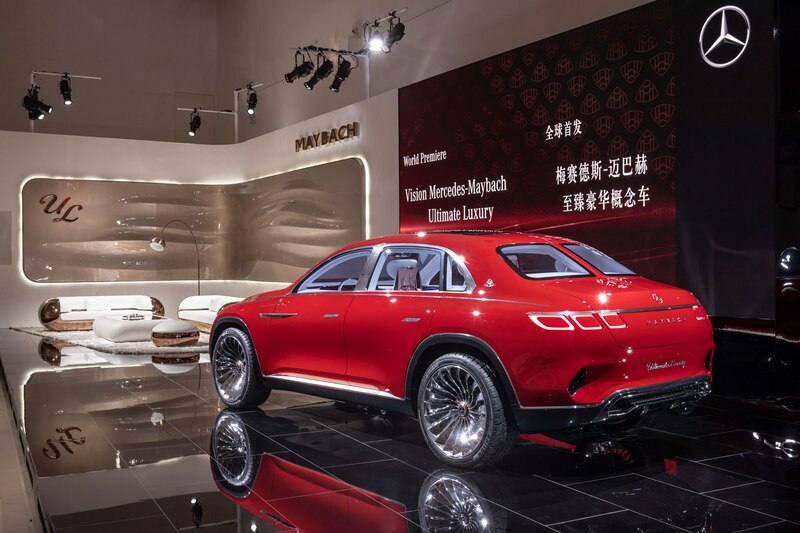 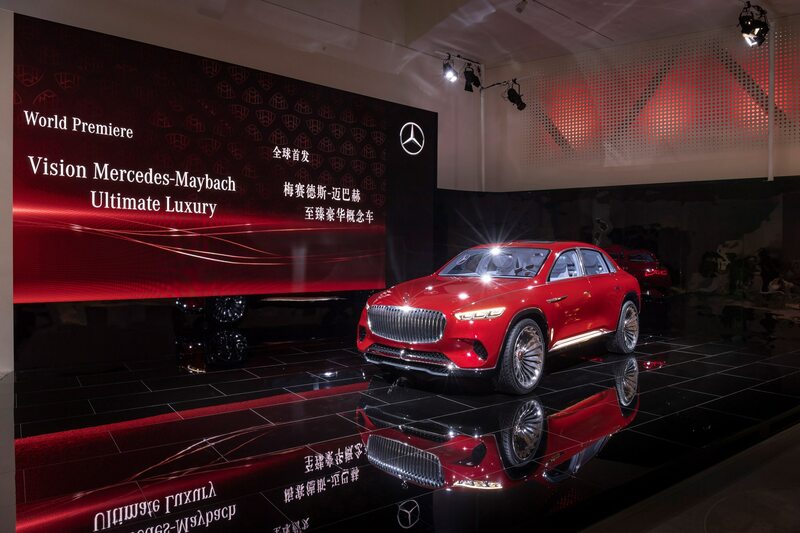 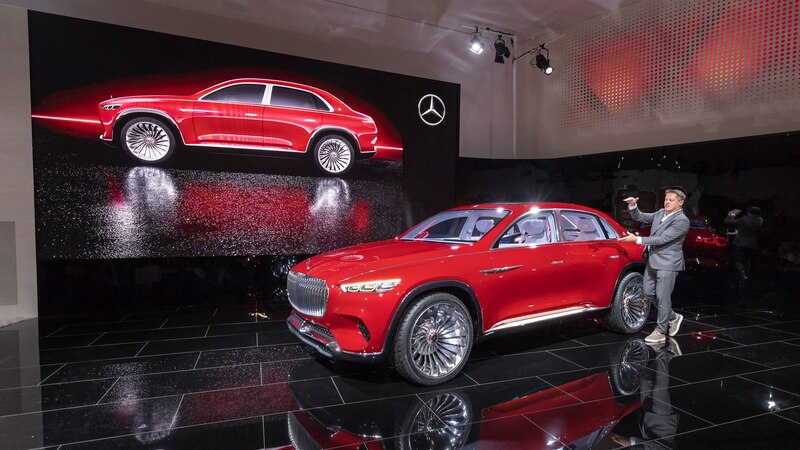 “The Vision Mercedes-Maybach Ultimate Luxury is a totally new archetype of a kind never seen before,” said Gorden Wagener, Daimler chief design officer, in a statement. 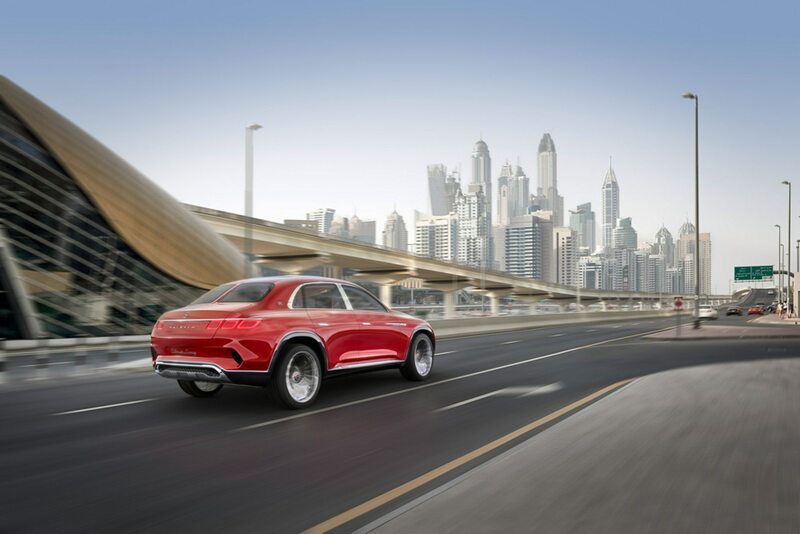 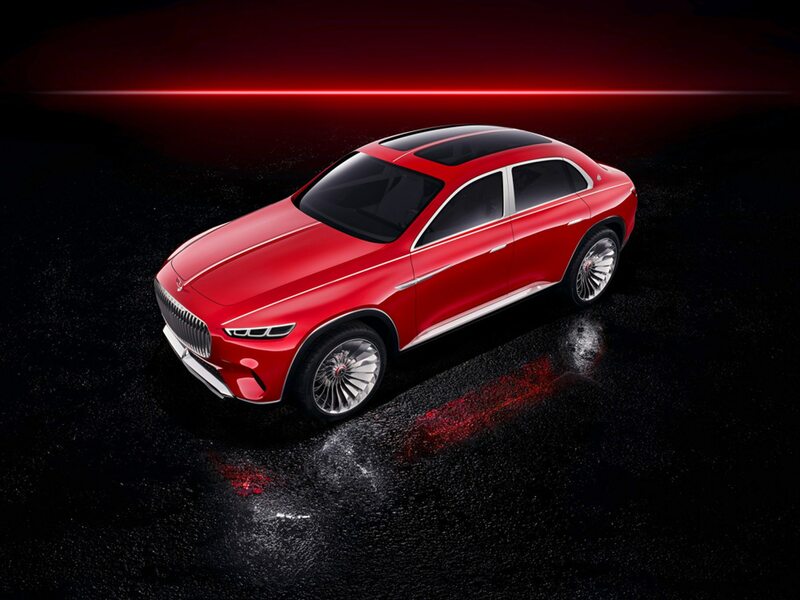 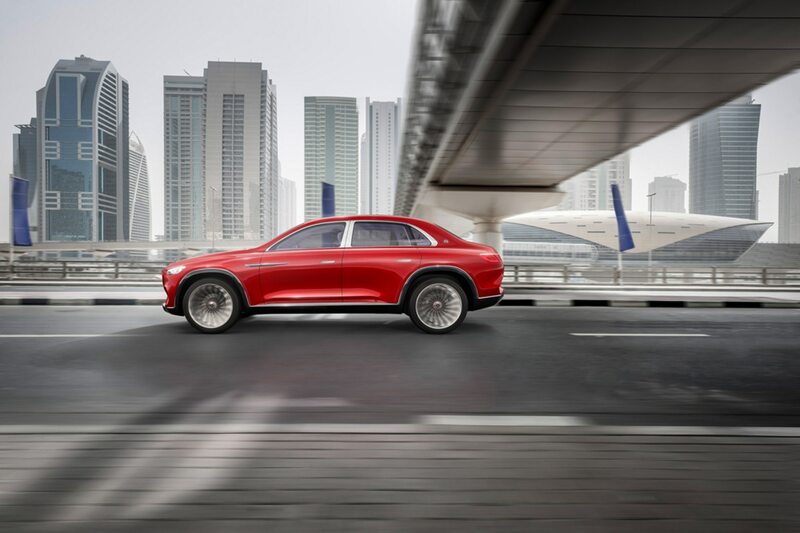 The chubby concept in metallic red was conceived as an electric car and is powered by four compact permanent-magnet synchronous motors for all-wheel drive. 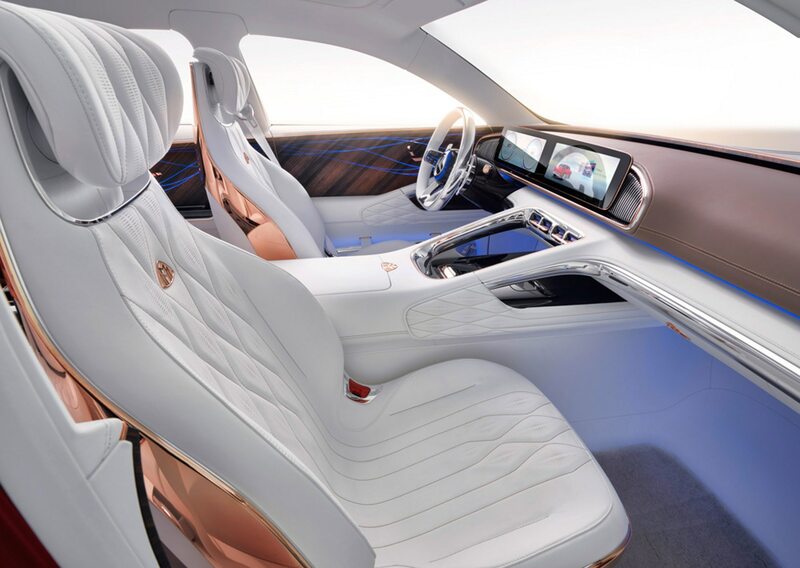 It measures 207 x 83 x 70 inches (L x W x H). 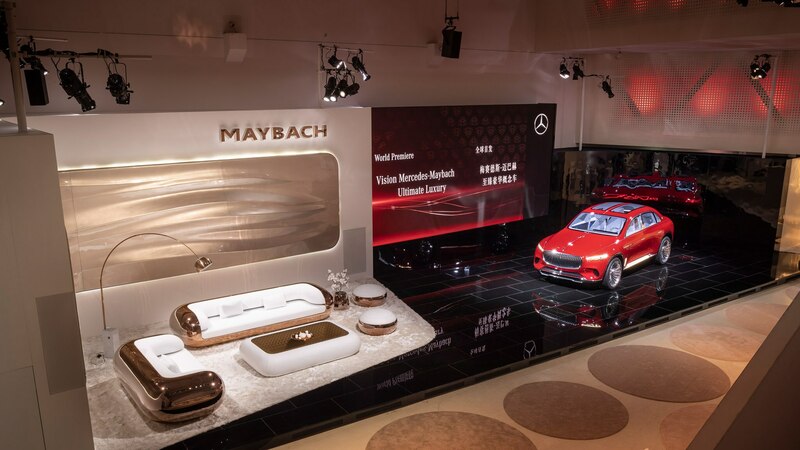 Mercedes-Maybach claims the powertrain provides 750 hp (550 kW) and its top speed is limited to 155 mph. 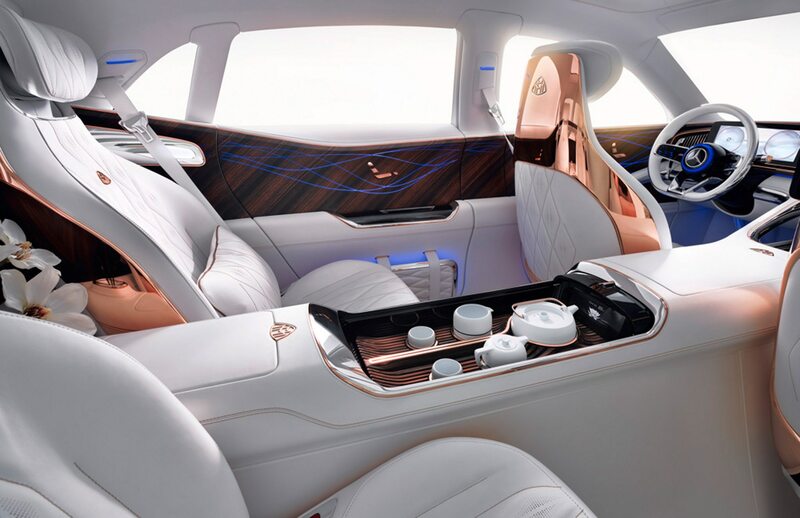 Its 350-kW battery sits under the floor and offers a range of over 200 miles. 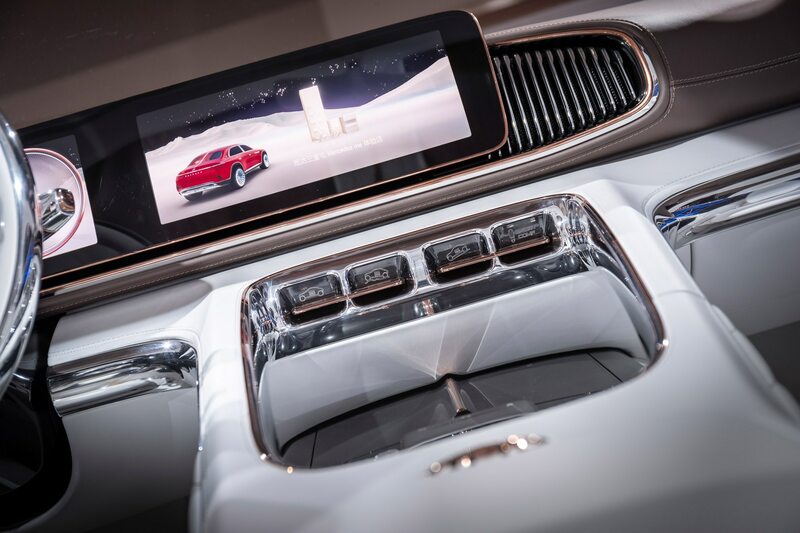 We are told it has a fast-charging function that allows it to add approximately 60 miles of range on a five-minute charge. 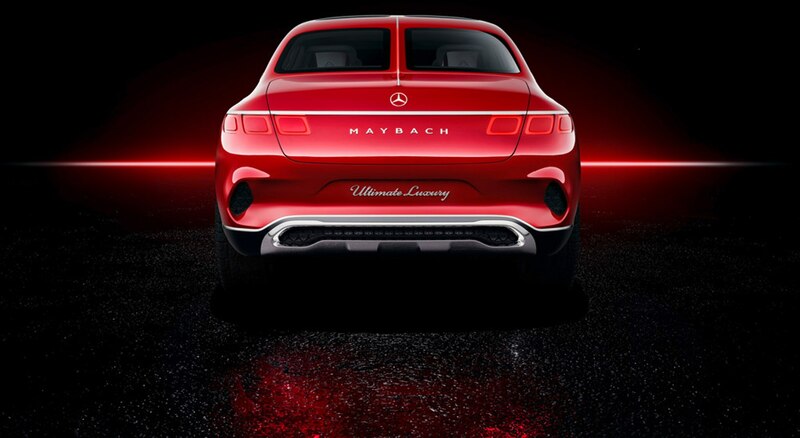 We’ll have to get back to you on that claim. 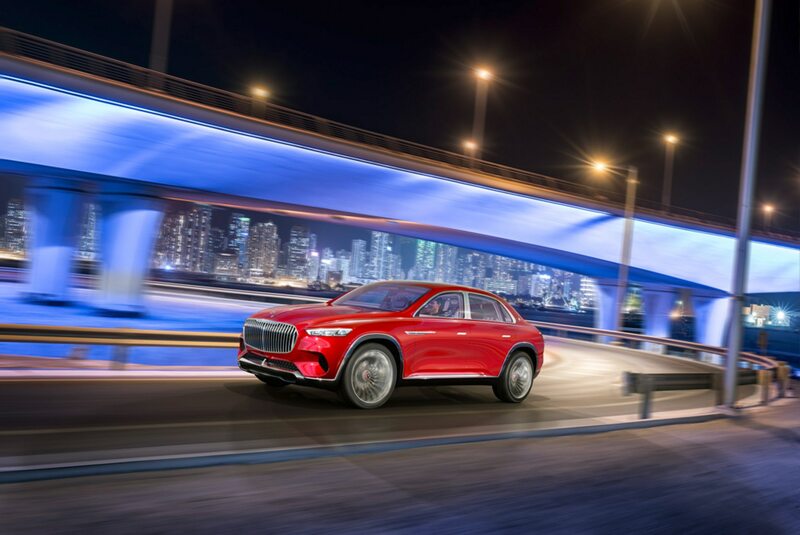 Aside from traditional plug-in charging, the concept can also be charged by induction, which is transmitted by an electromagnetic field underneath the crossover. 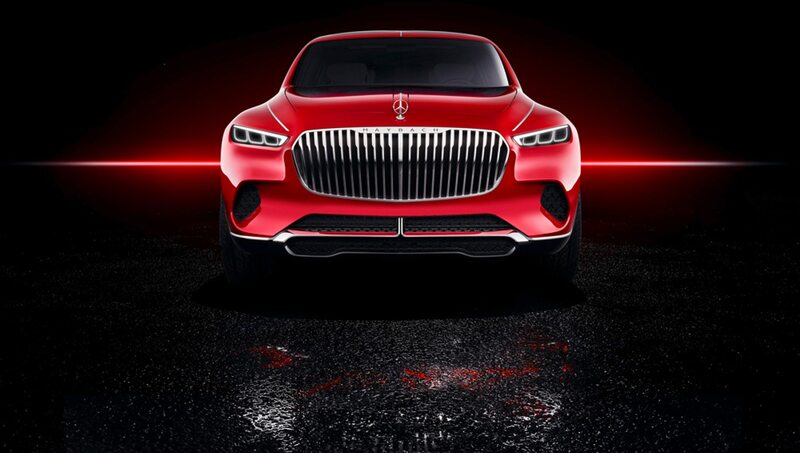 Our favorite angle is head on with its chrome-plated grille with vertical bars. 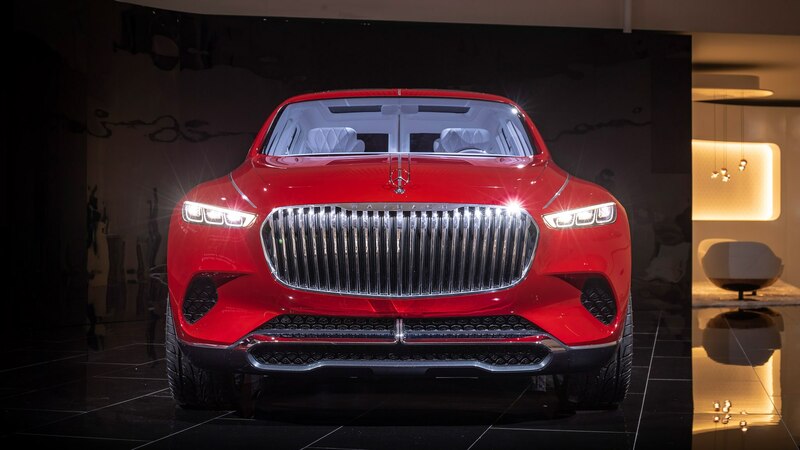 Low-profile headlights flank it and big air inlets with a honeycomb pattern reside below it. 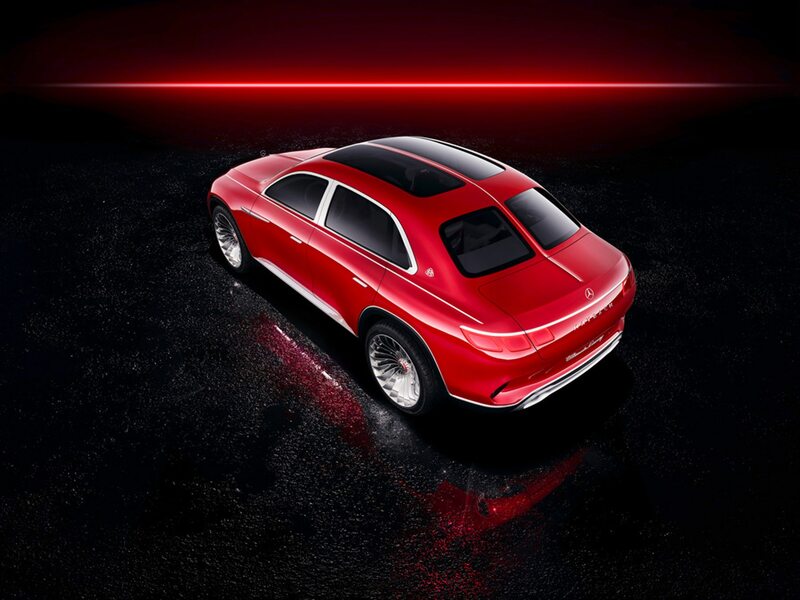 A continuous chrome trim strip from the hood to the trunk halves the car right down the middle. 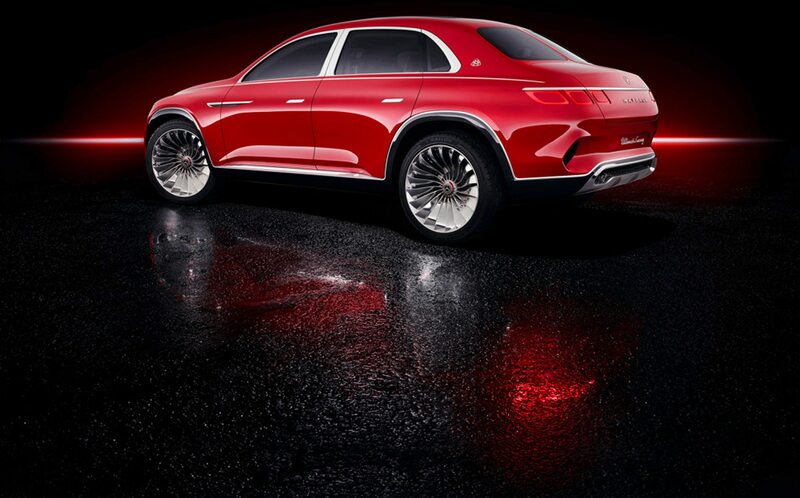 The sides get chrome trim, flush door handles, and it all rolls on 24-inch turbine-inspired wheels. 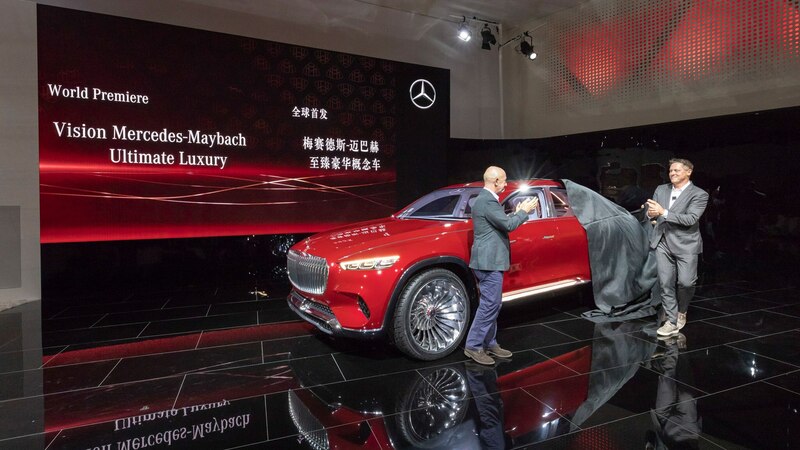 Around back there are three-part taillights, a split rear window (so retro), and the long moonroof on top is also halved in two side by side panes of smoked glass. 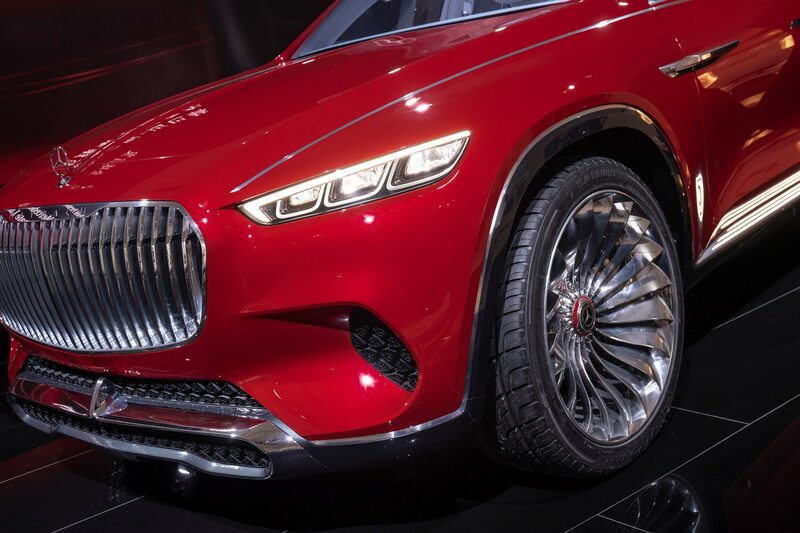 There’s another chrome strip, dual badging, and “Ultimate Luxury” scrolled in cursive chrome lettering across the bumper to remind folks behind you to get in line. 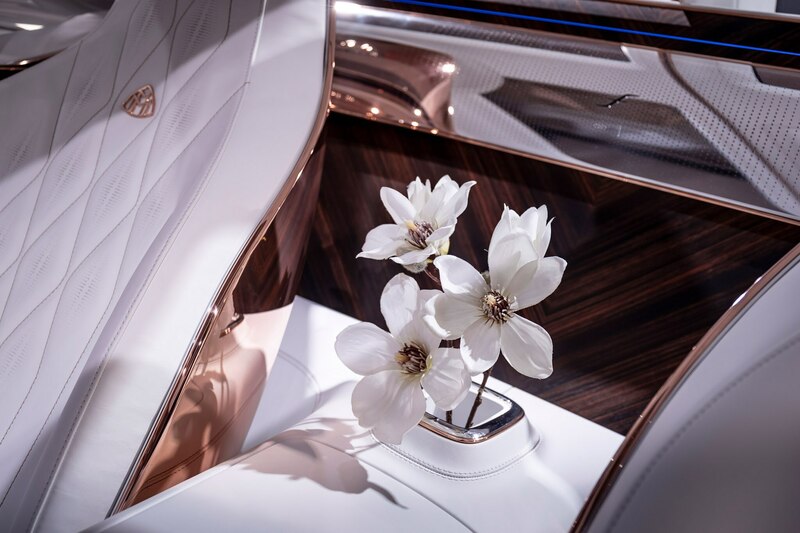 Inside, aside from the tea set, there are plenty of rose gold, crystal white, and pearl gray materials to feast your eyeballs on. 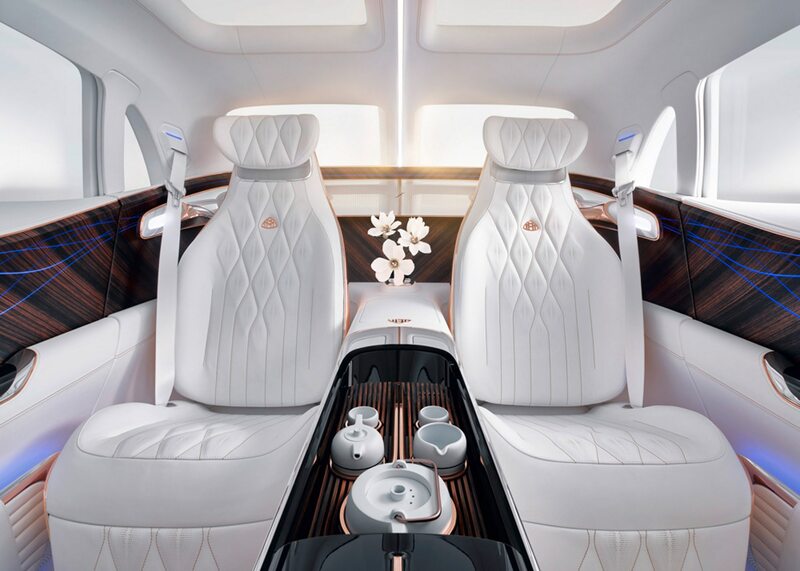 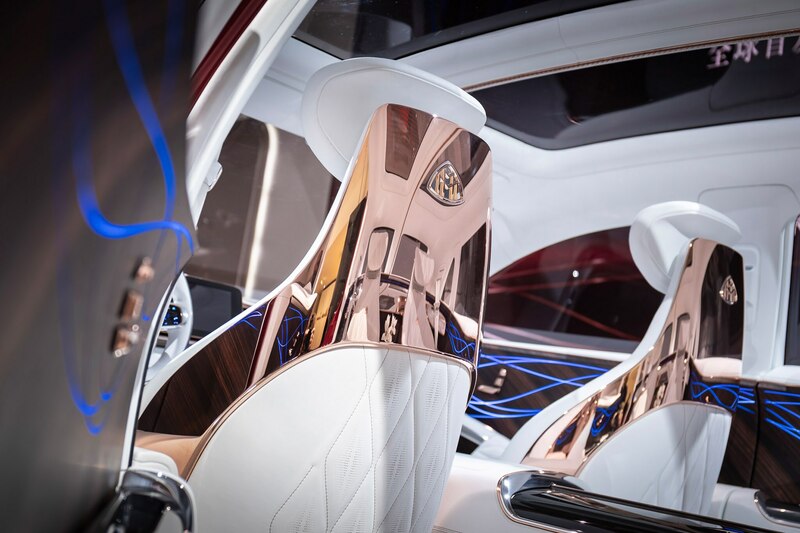 It’s gorgeous if you enjoy reclining crystal white Nappa leather seats with rose gold diamond stitching, dark ebony wood, and polished aluminum trim.